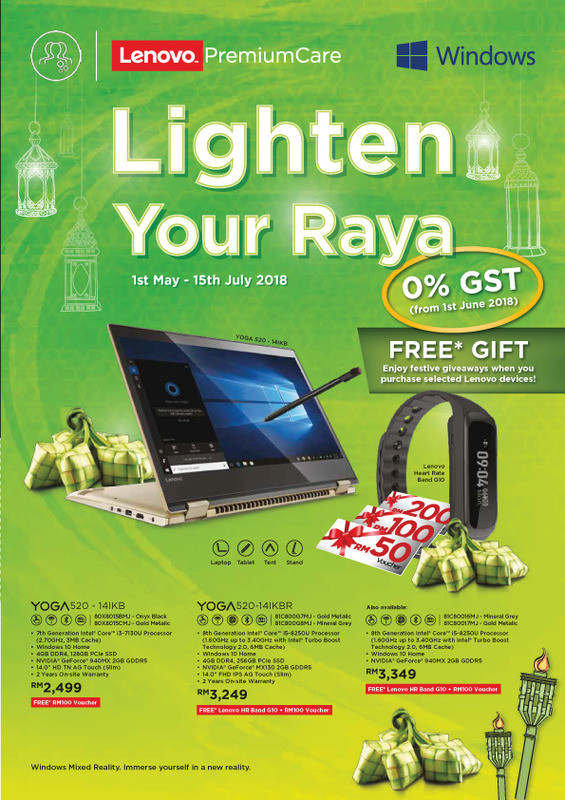 Lenovo Hari Raya 2018 Special Discounts ! To celebrate the joyous occasion of Hari Raya, Lenovo is rewarding all Malaysians with promotions on its wide offerings of consumer products, which includes the Lenovo Legion series, Yoga series, IdeaPad series and more. Customers will also receive a special discount for the Star Wars: Jedi Challenges on top of any purchase of Lenovo products. Additionally, Lenovo is extending its new warranty service, Lenovo PremiumCare at a special price on all products. This solidifies Lenovo’s continued dedication in making its technologies more accessible for everyone. For the whole month of June 2018, customers who purchase any model of Lenovo notebooks are entitled for a discounted price on the Star Wars: Jedi Challenges. With its original retail price at RM775, customers can now buy the first-of-its-kind Star Wars: Jedi Challenges for only RM249. Driven by overwhelming fan demand, Star Wars: Jedi Challenges now comes with a new multiplayer mode “Lightsaber Versus Mode”. Introduced in May 2018, it allows two players – each equipped with the smartphone-powered Lenovo Mirage™ AR headset, Lightsaber Controller, Tracking Beacon and a compatible smartphone – to face off in AR lightsaber battles in the same room. Star Wars: Jedi Challenges has allowed fans to hone their Jedi talents across a variety of augmented reality-based experiences, battling against legendary dark side villains like Kylo Ren and Darth Vader in Augmented Reality (AR) since its launch in late 2017. The multiplayer mode is now available in the Star Wars: Jedi Challenges app, which is free to download on the App Store® and Google Play™. Lenovo PremiumCare, a new warranty service that was introduced early May this year has extended its warranty upgrade promotion to 15 July 2018. All Lenovo products owners are entitled to the Standard Limited Warranty. Customers who upgrade to the Lenovo PremiumCare warranty are able to address any technical issues to the Lenovo PremiumCare Call Centre. Customers can reach the call centre any time 24/7, including national public holidays. For on-site technical support, technicians are available nationwide on weekdays, excluding weekends and public holidays from 9am to 9pm.